Billy McCord didn’t grow up eating shad in Manning, South Carolina, but today he’s one of the rare keepers of the vanishing art of shad filleting. American shad are notoriously bony fish, with estimates ranging from the hundreds to over a thousand bones per adult. The bones provide support for a soft-bodied fish that makes an incredible journey over its lifetime, but it also makes for a more labor-intensive dining experience than most Americans are willing to venture these days. In earlier centuries, when American shad were one of the country’s most important recreational and commercial fish species, fishmongers closely guarded their filleting secrets. Declines in shad populations and changing tastes, however, have turned shad meat into a niche item, though shad roe remains a delicacy enjoyed by many on the East Coast. 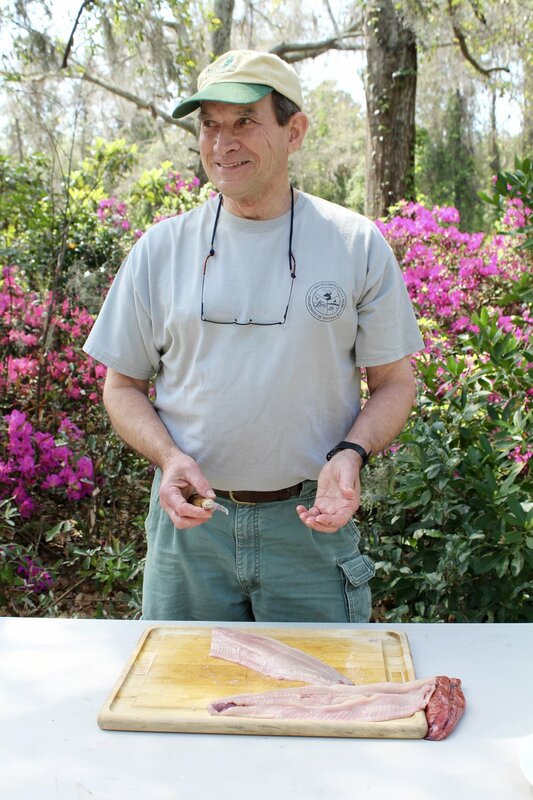 McCord didn’t learn to fillet a shad until the 1980s, when he began studying shad as a biologist for the South Carolina Department of Natural Resources (SCDNR). One day that job took him to a seafood market in Savannah, where he was collecting samples from the shad they were selling. “They had a guy that specialized in boneless shad fillets,” McCord said. “He just happened to be deboning, so I asked him if I could watch.” The rest is history, and McCord has since passed on the technique to others, including Crosby’s Seafood Co. in Charleston, where you can still buy deboned shad fillets. Today we’re sharing clips of his process with you. You'll need a very sharp knife, a surface that can be thoroughly cleaned afterward, and a great deal of patience -- but the reward, if done right, is fillets with the rich, buttery consistency of salmon. 1. Scale the fish using a metal spoon. Shad scales are large, loose, and easily removed – it’s the easiest part of the cleaning process. Good thing, too, to start on a confident note, as shad filleting will try even the most experienced angler. 2. Remove the sharp keel. Inserting your knife just behind the gills and in front of the body cavity, run the knife parallel to the bottom of the fish to slice off the keel bones. Be very careful to cut as close to the keel as possible so that you don’t pierce any internal organs or the roe. 3. Remove the roe. Pull the digestive tract loose from the vent and gently remove the roe sacs from the body cavity, taking care again not to tear the membrane. You should be able to feel around the body cavity and pull both lobes of the roe out in one piece. 4. Cut off the fillets of meat from each side. You do this just as you would for any large fish, making a cut just behind the head and dragging the knife along the backbone – you should be able to hear the knife clicking along the vertebrae – from gills to tail. Repeat for the other side and dispose of the remaining head, internal organs, and skeleton. 5. Remove the ribs from each fillet. 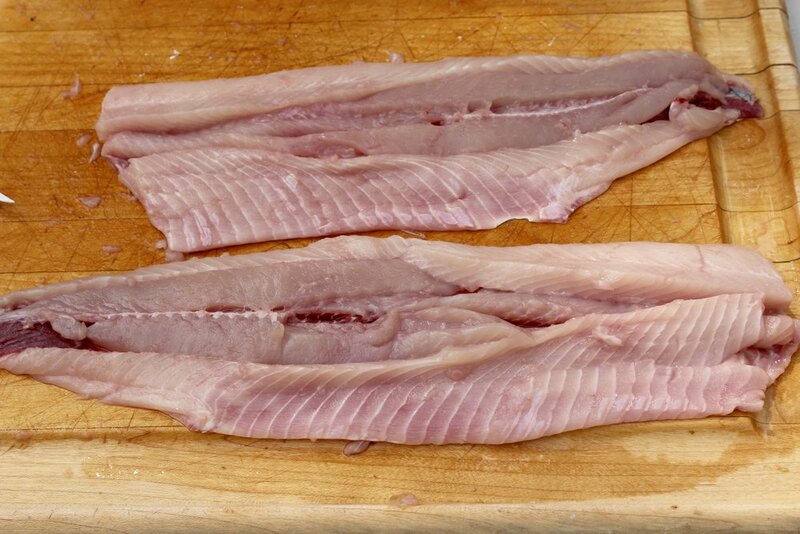 Again, this part of the process for shad does not differ greatly from other large fish, except that shad ribcages contain more bones than other fish. Score gently and repeatedly just behind the ribs, running the knife close to the bones so that you don’t lose much meat. 6. Now comes the challenging part. Simply stated, you’ll be making three sets of lateral cuts on each fillet to remove three rows of bones. Much of this work will be done by touch, as you can feel each row by running your fingers along the surface of the meat. It’s a great help to spend some time with your first fillet feeling the bones and envisioning where they extend and how to make the cuts. Some of the bones are simple, straight, and standing on end, while others are free-floating, y-shaped, intermuscular bones. Start by removing the row of bones closest to the ribcage area. Without cutting through the skin, make one long cut – from one end of the fish to the other – just below the row of bones. Next you’ll need to tackle the “tail” of these y-shaped bones. This part is difficult to describe, so reference the video clip – but it involves cutting out a small wedge of flesh (containing bones) between the skin and the bottom of the fillet. Finally, you’ll need to make another long cut – again from one end of the fish to the other – just above where you can feel the row of bones sticking out. Again, do not cut through the skin. Continuously use your fingers to feel the bones and pull them free of the meat. Ultimately, if you’ve made your cuts in the right locations, you should then be able to grab the strip of meat containing the bones at one end and peel it out, leaving the skin intact and a small gap where the bony row was. 7. Next you’ll need to repeat step 8 for the row of bones on the top half of the fish (refer back to clips above). Again, feel for the row, make two parallel cuts on either side of the row, and one curving cut to remove the bones embedded just above the skin. 8. Remove the row of bones running right down the middle of the fillet. This should be the easiest row to remove, and you can follow the same strategy of slicing two parallel cuts on either side of the row and then pulling the center length out with your thumb and forefinger. 9. Cut off the small knot of bones around the collar of the fillet (no video clip for this step). If you feel the thick end of the fillet (the part that was butting up to the fish’s head/gills), you’ll notice a chunk with bones protruding; simply slice this area off. 10. If at this point you’re feeling demoralized for mutilating your fillet, you’re not alone. It takes quite a bit of practice to get the hang of this complex process. But you still have another whole fillet to practice on! Repeat steps 6-9 for your second fillet. If all else fails, you can certainly cook shad without deboning it – just follow steps 1-5 and find a recipe for smoked or baked shad. Smoked shad is delicious, and the bones are easier to remove from the flaky white meat. Baking shad supposedly softens or disintegrates the bones, but it also requires hours of cooking (and results in a house that stinks of shad, which may offend some sensibilities). Alternatively, you can find a seafood market that sells deboned shad.